Swine flu vaccine-induced narcolepsy is costing European governments over $1 Billion due to liability waivers for manufacturers; and the same waivers were just issued for Ebola vaccines. The UK is paying out about $1.7 million dollars per victim. Although the media rarely reported on the severity of narcolepsy cases, vaccine-induced narcolepsy patients are much sicker than most people with narcolepsy. It isn’t only a matter of falling asleep; there is additional brain damage, including personality changes. Now scientists in Finland, where the first evidence for the GSK Pandemrix 2009-10 vaccine-narcolepsy connection was made, suggest it may be both a specific protein in Pandemrix vaccine, and an excessive amount of protein that caused narcolepsy, writing in PLOS. Until now, the best guess re causality was that the novel ASO3 adjuvant in the vaccine was the problem. 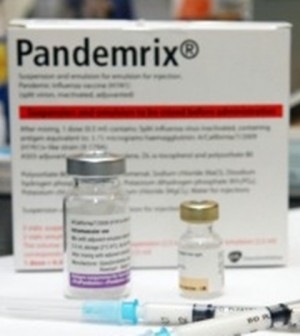 However, millions of Canadians received a similar GSK vaccine which used the same adjuvant, but Canada did not see an excess of cases from GlaxoSmithKline (GSK)’s Arepanrix swine flu vaccine. Only GSK’s Pandemrix, used primarily in Europe, seemed to cause this serious complication. The Finnish researchers note that the two vaccines, despite using identical antigens and adjuvants, employed different manufacturing methods. If so, this will be great news for GSK. It would mean their multibillion dollar ASO3 adjuvant might be used again. In fact, the narcolepsy fiasco barely hurt GSK, since the company suffered no financial liability for the narcolepsy cases. In order for a country to receive pandemic vaccines, it had to agree to assume the liability for potential injuries. WHO assisted in the issuing of liability waivers, as part of a pre-existing agreement with manufacturers. Only Poland refused to accept this deal. “It’s not about satisfaction. We don’t want to be seen as a country which opposes vaccines, we want to protect our citizens but not under the conditions set by the pharmaceutical companies,” health ministry spokesman Piotr Olechno told the BBC. Mr Olechno said the government had decided not to buy the vaccines because it could not guarantee there were no side effects and it did not want to take responsibility for those. Sylvia Burwell, current Secretary of the Department of Health and Human Services, recently issued a liability waiver to several companies (Merck, Johnson and Johnson, GSK) making Ebola vaccine candidates, identical to the swine flu vaccine waivers. If you receive one of these Ebola vaccines, you will be prohibited from suing the manufacturer for damages, if the vaccine causes an injury. Your only recourse is to ask DHHS to find in your favor and then pay you a relatively small award. The Reuters story on this subject is generally correct, but errs in comparing this liability waiver to that for childhood vaccine injuries. The 2006 Public Readiness and Emergency Preparedness Act (PREPA) waiver, issued only for vaccines like anthrax, smallpox, swine flu, adjuvants and Ebola, gives a much more extensive waiver of liability to manufacturers, and gives smaller cash awards. It also fails to pay legal fees, unlike childhood vaccine injury cases. The implications of PREPA are actually huge: vaccine manufacturers are being incentivized to perform only limited safety testing of their products, because if they don’t know about a problem, they cannot be held liable for it. I have written on this issue at length here, here and here. In 2009 the federal government did not inform citizens that the swine flu vaccine they were receiving had been issued a liability waiver. I suggest you inform yourself before accepting an Ebola or any emergency vaccines. Note that due to widespread concerns expressed in 2009 by me and many others, about potential side effects from adjuvants like ASO3, the US government (after purchasing large quantities of novel adjuvants to fight swine flu) did not use them. The US averted the narcolepsy epidemic seen in much of Europe. Posted by Vera Sharav | Wednesday, December 24, 2014 |	Categorized Vaccines, Conflict of Interest | Tagged PREPA, vaccine-induced nacrolepsy, Pandemrix, ASO3 adjuvant, GSK, vaccine liability waivers, swine flu vaccine Bookmark the permalink.